Sea angling is about balance, says Alan Yates, who explains why sinker size and line diameter are inseparable partners when it comes to casting, holding the sea bed and beating rough conditions. 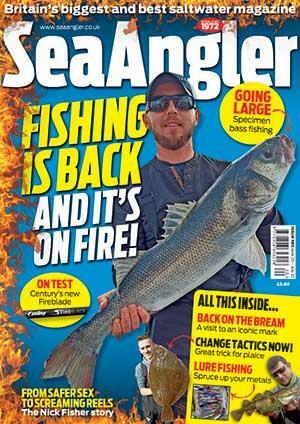 Why does sea angling gear appear to totally outgun the fish it is used to catch? You have probably guessed that powerful tides, rough weather and tough terrains have a lot to do with it. It is simple logic. The need to cast tackle and bait well out from the shore and anchor it there, as well as combating sea bed boulders, weed and snags, are the reasons we fish with strong tackle. Anything less wouldn't survive. It is possible to fish with light tackle, but when you have to cast a large bait a big distance into strong tide or a rough sea then you have to use the tackle and techniques that can cope with the conditions. Sea angling tackle has developed over the generations to a standard strength x dimension rating to cope with the conditions. If you go over or under that standard rating your control of tackle and ability to fish is impaired. Modern tackle has introduced a number of improvements and a tendency towards lighter more balanced gear, although that standard rating always remains. The sea leads, also called weights or sinkers, we use have been developed along this theme and are rated between 2oz and 8oz. Some are armed with wires to anchor them in strong tide and have a range of aerodynamic shapes to improve casting distance. Other refinements include grip wires that break free to make the retrieve easier or fixed-grip wires for extra holding power. Shapes include streamlined bombs, flattened patterns to lift the lead off the bottom quickly and even shapes that grip without wires. When you cast your baited rig into the sea the tide and wind reacts on the line between the lead weight and rod tip. If the tide or wind is strong this can result in the tackle being dragged along the beach, inshore and down the tide. Even when using a wired grip lead to provide extra grip, tidal pressure on the line can still move the tackle. You can change the weight of the lead to cope with the tide, while the line diameter can be reduced to lessen the pressure exerted on it by the sea. Standard beach casting tackle is 15lb (0.35mm diameter) mainline and a 5oz (150g) lead weight. These are the tackle ratings that are most consistently successful for casting distance and keeping tackle anchored in tide. However, line diameter and sinker size can be adjusted to suit fishing conditions. For instance, a heavier lead (6-8oz) can be used to tow multi-hook or large baits through and into a head wind. Heavier line (038-0.40mm) can be used to beat snags, while light line with a lower diameter (0.32mm) can be used to improve casting distance. It's the balance of your fishing tackle that matters. For example, it is of no good using an 8oz grip lead to combat really strong tide or wind if you then use a very thick line because 0.45mm mono will not only reduce casting distance, but will also create more drag in the tide and therefore put more pressure on the lead's grip. Similarly using a line that is too light (say 0.28mm) may improve casting distance and the ability to hold in the tide, but it may be too light to cope with a mixed sea bed. Grip wires are an important addition to a sea angler's armoury. Many anglers use a breakout grip lead for all their fishing because of everpresent tidal movement. It's a fact that the tide is slack on occasions, but these periods are the least productive for fish. On the other hand, strong tide generally offers the best fishing because the fish use it to travel and seek out food. You just cannot ignore the presence of the tide and your choice of lead must reflect its likely influence. 1. Heavier leads tow baits and penetrate wind more effi ciently, but the trajectory of your cast is most important in windy and rough sea conditions. Casting low to the sea can punch tackle further, while casting high in a following wind will increase distance. 2. Casting distance is the most crucial aspect of shore angling for the beginner. A good caster can choose the distance to fi sh, but for most novices the furthest is the best. That's a good reason to use a 5oz lead weight to start with because it's reckoned to be the most compatible in terms of the average angler's build and casting power. 3. The most turbulent sea is in the fi rst 60 yards or so. Putting your bait beyond that helps prevent it being swept ashore and that is also a good reason to use a lead with grip wires. 4. The size and number of baits, as well as the weight of the lead, infl uence the distance you can cast. Don't sacrifi ce bait size to increase distance. Your bait's scent is the most potent weapon to attract the fi sh to the hook. Bait clips also help to increase casting distance. 5. Heavy lead weights sink faster than light ones. In stronger tide and deep water a heavy lead will land on the sea bed closer to where it enters the water. A lead that is too light may be too far down the tide when it hits bottom so its grip is impaired by the angled pressure on its hold. 6. Cast slightly uptide to compensate for any downtide movement of your rig once it is in the water. 7. Once the lead has hit bottom the straight line will pick up maximum limited tidal pressure. The tidal pressure is reduced by letting a bow form. In many situations the bow forms naturally and cannot be prevented. If fi shing close to other anglers make sure you do not cast over their bow and catch their line. 8. Use a plain lead or remove the wires from the standard grip lead to allow a bait to trundle down the tide to a back eddy where food may collect. Designs with pimples, like the watch lead (right), or odd shapes to add grip are an option when fi shing in surf to reduce movement. There are lots of plain lead shapes, plus groundbait feeder versions, and all have a place in sea angling. 9. The type of bottom will make a difference to a wired grip lead's holding potential. Long springy wires on a fi xed-wire lead are better for mixed stony ground because they will allow you to hold and also release from a snag easier. Short wires hold better in mud and sand, while you can fl atten the ends of grip wires or add tubing to gain extra grip on soft sand or mud. Soft-wired grip leads are most suitable for snaggy ground, with stiff wires best for really strong tide. 10. One lead weight cannot answer all the likely problems so you need to carry a selection. Combination leads, such as those from Gemini, are ideal for this because they have removable grip wires, changeable heads and bodies, plus various lengths of grip wire and tail wire.